This is the Ultimate Packing Guide for the Alps based on years of hiking experience packed into one article! You can walk in any gear or with no gear – after all, that’s what we humans are designed to do. However, when exposing yourself to the elements in the mountains, there are things to consider for safety and comfort, and essential gear that you just simply need to have. Most of the things needed for the Alps are the same as any what you need for any hiking trip but not all. I’ll explain below why each item is needed and what my recommendations are. This article contains links and recommendations to items I use myself. Although I stand by my recommendations, do take them with a grain of salt since what you wear and use in the mountains is a very personal choice. What works for me doesn’t necessarily work for you. There’s plenty of gear review sites out there to get other points of view. All product links go to Amazon and you can help support this site by buying anything you need through the links. With some of the items I mention below, there are big differences in availability between Europe and the U.S. (and other places, too). Depending on your location, the Links below should automatically take you to the Amazon near you – such as Amazon UK if you’re in the UK and Amazon.com if in the U.S. and so on. Thanks for Subscribing! Download the Checklist now and start packing for your trip! 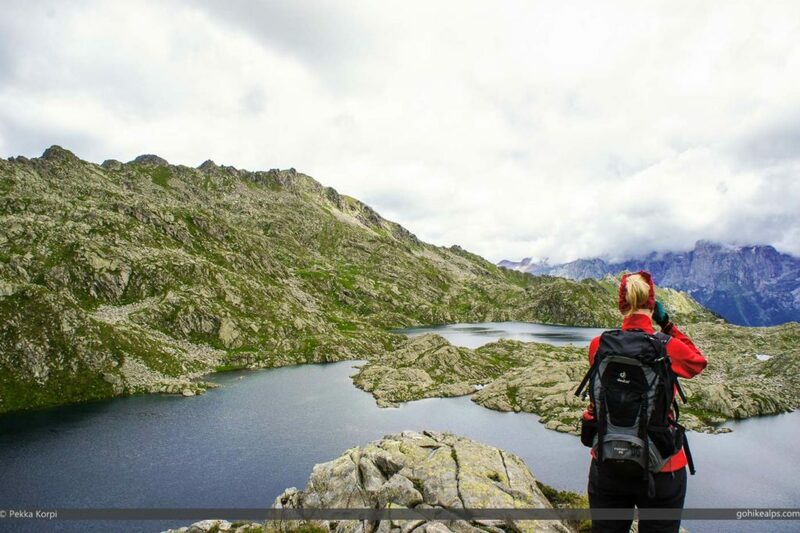 Click here to download the Gohikealps Packing List! Planning to hike the Alps? Sign up for Gohikealps Inspiration & Advice Now and get our exclusive One Page Printable Gear Checklist - designed specifically for the Alps! Guaranteed to save you a headache when it's time to pack! Thank You for subscribing. Now download the Checklist and enjoy your hike! I like to think of scenarios for planning purposes so depending on how I expect my trip to turn out, I pack accordingly. If I go to the Alps, my trip is often a combination of these so I pack for the most demanding scenario and then leave things behind if I don’t need them, i.e. at a hotel or in a car. Sightseeing: Taking a cable car up from a resort/town/city to walk around a bit and maybe have lunch at the cable car top station. Not really a hike but a nice day on some mountain, nevertheless! Day hikes: Going on a proper trail, probably out of any resort areas but coming back to the same place for the night. The day is spent “out there” so you’re exposed to changing weather and often there’s no shelter nearby. Multi-Day hikes: Going out on a longer stretch from point A to B and then C, D, etc. for X number of days and nights. Staying in a different place every night but mostly where food and a bed are available. 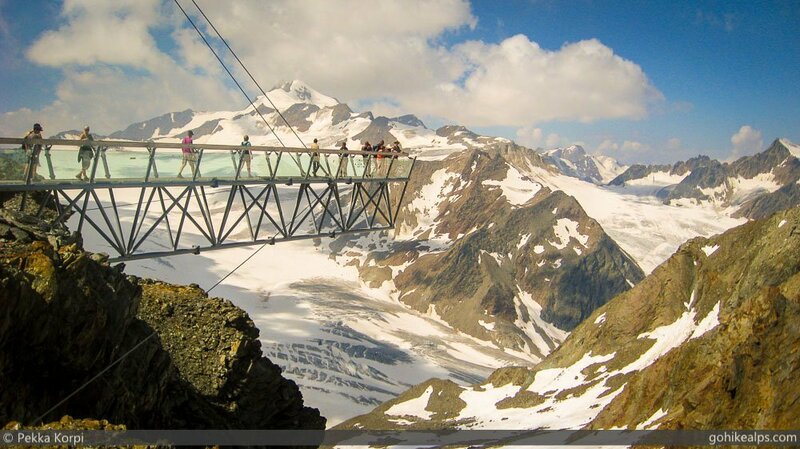 Viewing Platform above the Tiefenbach Glacier with a view to Pitztal – Sighteeing at its best! 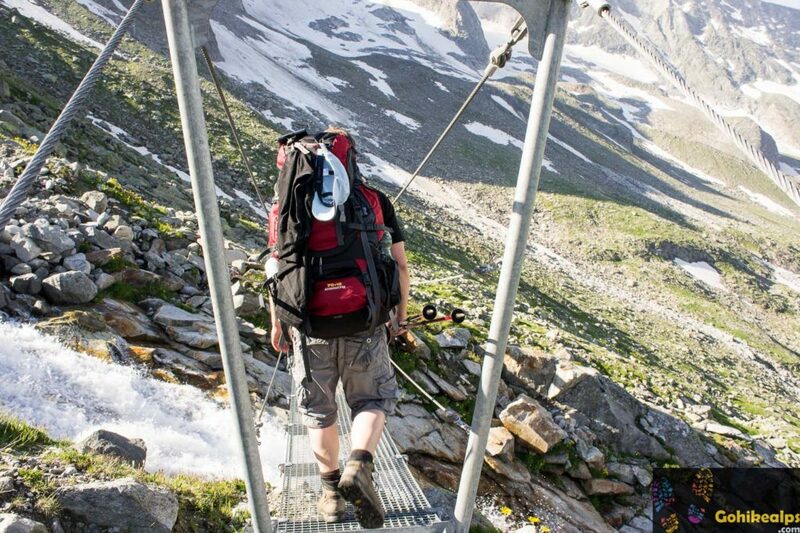 Yes, many hiking routes in the Alps go on glaciers. Unless you know what you’re doing, don’t go. Just don’t, glaciers can be deadly! If you do know what you’re doing you’ll already know that you will need additional gear such as crampons & ice axes etc., and you’ve hopefully acquired adequate training and experience. I’m intentionally not listing mountain climbing separately here, apart from mentioning the Via Ferrata. I’m also excluding from this article my Wilderness scenario, which in my book means going out on your own, possibly camping out and carrying your own food. This requires carrying your food, cooking gear, tent etc. etc. As far as hiking the Alps go, going into true wilderness is a rare occasion. In fact, camping out is forbidden in most places outside of designated camping areas anyway. In this article I’ll concentrate on the three basic scenarios, since they are relevant for most people hiking the Alps. I’ll cover Via Ferratas in a separate article. Your shoes are your best friend or worst foe on any longer walk. If not chosen with care, they can cause you an unnecessary, painful experience. For the Alps, you should get hiking boots. Good ones help protect you from ankle sprains and other injuries and keep you safe, dry and warm. This is not the item to save time or money on so go into a specialized store and try on several shoes before deciding. Do this in a place where they have knowledgeable sales people and an indoor testing area where you can test the shoes walking uphill and downhill. If they don’t feel great in the store, they won’t feel great in the mountains, either! I’m a big fan of buying things online but this is one of the things I recommend not getting online unless you know exactly what you are getting. If you do, I’ve walked hundreds of kilometers in my Lowas and they’re great. Meindl gets great reviews and is my other preferred brand. For Sightseeing, any shoe may do but if you go off on any kind of trail in the mountains, good Hiking Boots are a must. If you’re going high up, get high alpine shoes designed for the mountains – they’re different from shoes designed for walking in the woods. And make sure the boots you get are waterproof, which practically means they should have Gore-Tex®. Click here for the Lowa selection on Amazon, and click here to see the Meindl range on Amazon! A great shoe is easily ruined by a bad pair of socks. The socks you wear are essential to your comfort. Your feet will be sweating and moisture needs to get out of your shoe. The socks help do that. If your feet get wet, you will have blisters. I recommend getting socks designed for hiking. They have reinforcements in the right places and are designed to transport moisture out of the shoe as you walk. I’ve tried several brands and have settled on Falke and X-Socks. I use both brands for skiing, too. Click here for Amazon’s Falke Trekking Socks! After your shoes, choosing your backpack is probably the second biggest decision that affects your comfort and, of course, what you can take along. You should get one that meets your space requirements and feels right. For Day Hikes and Multi-day hikes (& Wilderness) I’ve always used Deuter backpacks. They’ve adjusted just right for my body and I’ve never had a problem with them. My wife has a Deuter for day hikes and Osprey for Multi-day and she strongly prefers the Osprey – it just fits her body better. Point is, get what’s feels right to you. For day hikes I recommend getting something that takes in 25-35 liters. I have a 32 liter Deuter and that’s enough to pack in an additional mid layer, rain gear, lunch, water and decent size camera. There’s a big difference between 25 and 35 liters so think about your needs. For multi-day hiking in the Alps, I would recommend something like 60 to 65 liters. This will hold enough stuff for a week or longer and the bag itself is still a reasonable size to carry. I have a 70+15 liter Deuter Air Contact Pro. It’s a real monster and honestly overkill for most trips in the Alps. I use it for wilderness trips, too, where a week’s worth of food might be packed in, too, as well as a sleeping bag, cooking gear and tent. Because the Deuter 70+15 is designed to carry really heavy loads, the carrying mechanism is very comfortable with lighter weights. It never gets packed full for the Alps but since I use it for Wilderness, too, it’s worked great for me. It’s big enough you can almost live out of it. My guiding principle here is that it’s easier to leave space into a backpack that’s too big than it is to try and force items into a bag too small. Again, opinion. I know some may disagree. By the way, whatever backpack you get, make sure it has a rain cover. Most good ones have one built in but if they don’t, you really need to get one. Here’s Amazon’s range of Deuter backpacks and here’s their selection of Ospreys! You will need a selection of clothes and the longer you trip, the more important it is that you choose with care. Layered clothing is the way to go with high quality base layers, mid layers and water proof outer layers. Do not use cotton, it gets wet. Forcella d’Andersass. 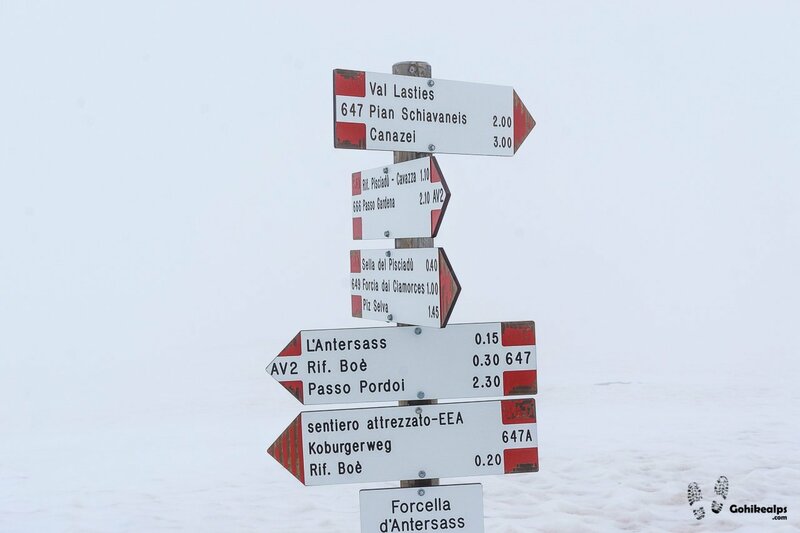 Whiteout conditions on the Sella Massif in early July. Nowadays I use Merino Wool base layers only. I have T-Shirts, long sleeve shirts, long pants underwear and headwear. Merino just works. I can use a Merino t-shirt for 3 days heavy hiking without washing and more if I had to and I would guess. It might sound kind of gross if you’re new to multiday hiking but if there’s nowhere to wash your clothes and you want to lighten your load, you don’t have much choice. As far as what to get, Icebreaker rules and their stuff is easily available and I think reasonably priced. If you want something a little different, I also recommend DeVold. Outstanding quality but tends to be hard to find outside of Europe and expensive. Please comment if you know otherwise. There’s a whole bunch of other brands, too, but for me Icebreaker and DeVold have worked best. If you’re going to carry stuff on your back and wear it for days in a row, quality is worth the money. By the way, don’t get something that has a little bit of merino in it and is marketed as merino. These products can be good for everyday use in city conditions but in my experience, they will stink after a day in the mountains. There’s a nice, big selection of Icebreaker Merinos on Amazon, click here to check it out! Merino is excellent for mid layers, too, although I happily use fleeces, too. These are very usable in all kinds of situations outside of hiking, too, so investing in quality makes sense. My favorites in this category are Arc’teryx, Haglöfs and Norrona. Arc’teryx is very available on Amazon all over, click here to the Amazon Arc’teryx selection. Haglöfs is easy to find in Europe, less so in the U.S. – Click for the Amazon Haglöfs selection here! Unfortunately the same seems to apply to Norrona – easy to find in Europe, not so much in the U.S…. Here’s the Amazon Norrona selection, nevertheless! You will need a good pair of pants and a good pair of shorts. Most of the time in the summer I have a pair that turns into shorts if needed and then a pair of shorts. Your pants should be quick to dry but at the same time durable. I go for light weight and if it’s really cold, I’ll just wear long underwear on my base layer. Most of my hiking pants are convertible so they can be used as shorts, too. All the major brands have great products in this category – my preference is again Haglöfs and Arc’teryx, sometimes Peak Performance. Arc’teryx available everywhere it seems – Click here to the Amazon Arc’teryx selection! Haglöfs easy to find in Europe, less so in the U.S. – Click here for the Amazon Haglöfs selection! Norrona – easy to find in Europe, not so much in the U.S. – Click here for the Amazon Norrona selection! In the pants category I also want to mention Fjällräven. These are excellent quality products which I often use – and these I normally choose for a Wilderness type of trip. Click here to check out the Fjällräven collection on Amazon. This is the most personal choice of all, so I’ll not recommend anything other than having a clean pair for each day. Either carry enough of them and/or wash along the way. As far as I’m concerned, Gore-Tex is the answer. You will want to get both a jacket and pants. I currently use an Arc’teryx jacket and a pair of Haglöfs pants. They’re both made of Gore-Tex® PacLite® which is very thin, very light and therefore suitable for the mountains in summer conditions. They’re both just an outer layer which can be pulled on at any time. It will help you a lot, if the pants have a zipper on the side which goes all the way from bottom to top. You can easily put them on quickly without taking your shoes off. One of those days when the Gore-Tex was on for the entire day. With some of the really thin and light PacLite® jackets there is a small downside: the inside of the jacket is basically the Gore-Tex® membrane which is not very comfortable if directly against your skin. If it’s cold, you’ll have your layers under the jacket so it’s not a problem. However, if it’s warm and you need to walk in the rain, the mid layer can be too much. If I know it’s going to rain all day, I just put on a long sleeve shirt and long sleeve underpants and then the Gore-Tex® jacket on top of that. No mid layers, no pants. I find this to be the most comfortable option but please comment if you know a better way! Theoretically all Gore-Tex® products have to be high quality because the brands need to earn their right to use Gore-Tex®, or so I hear. I have found, however, that quality is not always a given. It’s hard to know beforehand, but the Haglöfs pants and Arc’teryx jacket I’ve had for about 5 years and in addition to hiking, I use both for Golf. There’s no visible sign of wear & tear so far. Click here’s my Arc’teryx Alpha SL Jacket on Amazon. Excellent jacket. As for the my Haglöfs pants, I couldn’t find an exact match, but this is very close: Haglöfs L.I.M III Q Trekking pants (on Amazon)! I’m sure you get the idea. I always have a pair of (light) hiking gloves with me. After some experimentation, in my opinion Hestra gloves are the best. I also use Hestra gloves for skiing. Hat for the cold. It can be cold in the summer, too, so get a hat that will keep you warm. I normally use a Merino cap and sometimes a Buff. All the brands mentioned above have nice hats for this, and of course Amazon has a huge selection of Buffs. I would get the Merino kind. Hat for the sun. This is important, the sun can be brutal and you’re likely to sweat off any sun screen you might have put on. a Buff works here, too. Make sure your belt is comfortable. Most likely it will be between you and your backpack so it can’t be too thick. I went for years without poles and that was ok. I was fit enough and didn’t know to miss them. Now, however, I wouldn’t go out without them. I find them extremely helpful especially on longer hikes with more gear and weight to carry. They help you balance and make your moves more efficient. Especially when going downhill, they reduce the stress on your knees. They provide much more friction if you need to cross patches of snow or mud. All in all, I recommend them highly. Make sure you get quality ones. Cheap ones are often heavy in themselves and unreliable. I currently use Komperdell sticks and my wife uses Leki. Both have a wide selection and basically the lighter they are, the more you’ll have to pay. Komperdell poles are readily available at Amazon and so are Leki. Follow this link for Leki poles on Amazon. If you’re going sightseeing on a cable car and plan to have lunch at the restaurant on the top end, you obviously don’t need to carry food. For a day-trip, chances are you will walk up to a mountain hut to have lunch so again no need to carry much food. The same applies to multi-day hikes to some extent: on most hikes you’ll have an opportunity to visit mountain huts for lunch and you’ll probably have dinner & breakfast where you stay for the night. This is the beauty of the Alps – no need to carry what you eat. 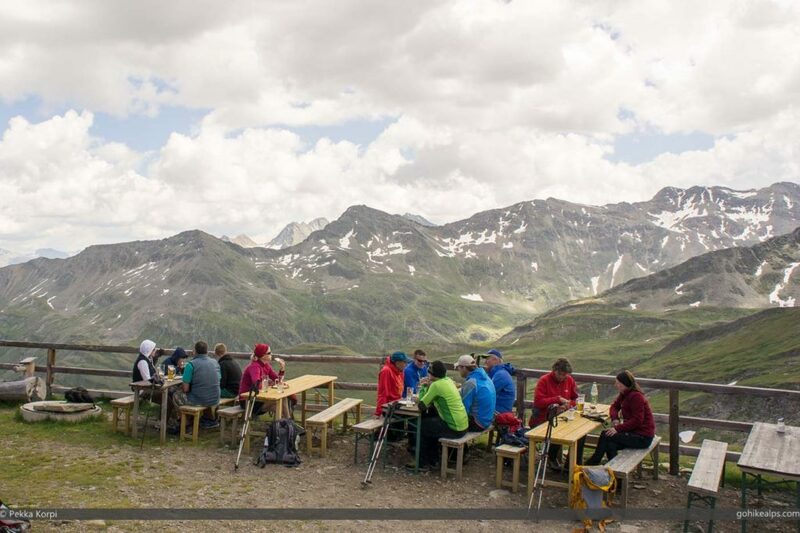 No need to carry food… lunch at the Salmhütte, next to Grossglockner. You should, however, always have something for bad weather or an emergency and appreciate the fact that it can be a long walk before you get food. In many places there are long stretches without huts or restaurants, so in these areas you may need to be self-reliant for a meal or two. Make sure you plan ahead if this is the case. I always pack some chocolate and dried meat when I go. They stay edible for days or weeks despite heat or cold. Some people also pack cheese and, of course, nuts and raisins are great. The calorie/weight ratio for all of these is good. These will also sustain you in case you get lost or stuck somewhere. All of these are also great for lunch, if you decide you want to eat privately in some beautiful location. Being in the Alps, any local grocery store will have a good selection of long lasting, excellent tasting foods. Always, always, always have enough water with you. I usually have 3 liters for a day if I’m not sure I can fill up somewhere. I know many people carry less and if you’re just day hiking a short distance up to a mountain hut for lunch and back that’s fine. However, if it’s a hot day, you’re ascending serious vertical, carrying a big load and going on for who knows how many hours, the dehydration you experience really is something to take very seriously. Make sure you drink enough and at regular intervals. Tap water in the Alps is generally excellent and that’s what I prefer. I have SIGG water bottles in three sizes: 0.5 liters which is always available on the side of my backpack and a 1 liter for when the small one runs out. I then have a 1.5 liter one which is normally inside the backpack (because it’s too big for the sides), used for filling the others when they run out. This might seem overkill but there’s some reasoning behind it: water purification. I always have water purification pills with me for emergency situations. The dosage is 1 pill per 1 liter so if I must use them, I’ll use the 1 liter bottle for purification and I can then fill the others. After the first purification round, I can do another to top off the 1.5 liter one. After the 3rd purification round I’m back up to 3 liters. There’s normally water to be found, often lots of it. If you want to drink it is worth giving some thought to. If you don’t have the SIGG (or similar) water bottles and don’t want to get them, for day trips I think it’s fine just buying a six pack of 1,5 plastic water bottles from a local grocery store and use those. I’ve never had one break but I wouldn’t trust them for a multi-day hike or any kind of wilderness situation. The aluminum SIGG’s last forever and work great for everyday use, too. They’re even good gifts so I find myself having bought quite a few over the years. Click here to see a LOT of SIGG bottles and other stuff on Amazon! Here’s my long list of things that you should consider having with you. Easy to forget, sometimes not needed but invaluable if you do need them. These are not in any particular order. Bag Liner for sleeping at mountain huts. The huts normally have blankets and pillows but no sheets so you need the liner. Of course it doesn’t have to be silk but silk works great and is light. I use a Cocoon. Click here for some examples on Amazon. Microfiber Travel Towel. Light to carry, dries quick, doesn’t take much space. Examples on Amazon here. Compass. In the age of mobile phones and GPS this may seem old fashioned. It’s not, it’s a safety precaution and they don’t cost much. Batteries eventually die and you should save your phone batteries for emergencies anyway. Make sure you know how to use it and getting one – Suunto is my preferred brand. First Aid Kit. If you cut yourself against a rock, you will need it. If you sprain your ankle or break your arm, you will need it. Learn how to use the items inside. There’s a big selection and a variety of sizes. I opt for the small & light ones and complement with my own medical kit if needed. Wine bottle opener. This may come in handy if you like wine. Something like this works. Iron Wire. I carry a tiny roll about 1 meter / 3ft long in my bag just in case. Can be used very creatively to fix things, hang things. Athletic Tape. Another item that can be used creatively to fix things. I prefer athletic tape to duct tape because it’s lighter and has more uses. It can be applied on your skin for its original purpose but it’s strong enough to fix things. Flashlight / Headlight. You might be caught in the dark so make sure you have a working light with you and remember batteries. Keep in mind you may not be able to charge things on the mountain so consider getting these with replaceable batteries. My flashlight is a Maglite an my headlight a Petzl. Cord. I always have some. Use it to dry your clothes on or as a temporary shoe lace in case on gets cut. Sun glasses. A must. As mentioned before, the sun is brutal. Keep in mind it’s easy to drop them so get something that doesn’t immediately break. Sun screen, preferably a kind made for sports because you will sweat. The sun is brutal. Lip balm. My lips always dry up not only because of the sun but also dehydration. Something to make a fire with. Again just in case, I always have a lighter with me. Keep it dry. Toilet paper. I suppose no need to explain… Just make sure it stays dry. Mine always travels in a small plastic bag or Dry Bag (see below)! Cash. A lot of the mountain huts don’t accept credit cards and even in towns cash is often preferred. Your Basic Medications. You know what you need but make sure you have a painkiller and something for diarrhea. Also I recommend taking along single use (and individually packed) disinfectant wipes and blister cushions such as Compeed. Toiletries. Whatever you need to keep yourself clean & civilized in travel sized, minimum weight packaging. Eye wear. If you use contact lenses, I recommend the single use kind since you want to carry minimum fluids. It’s also more convenient with occasionally questionable hygiene. Take your glasses, too, just in case and/or for evening use. Ear Plugs. If you sleep in a mountain hut dormitory, there will be a lot of snoring. Trash bag. If you can carry something up the mountain, you can carry it down, too. Don’t litter. Dry Bag/ Dry Sack. For longer trips I pack some base layer clothes, along with backup money into a dry bag. If you get soaked and your rain cover fails, it’s nice to have at least something dry. Make sure what you get is lightweight. Washing powder in single use pouches for hand washing your clothes at mountain huts or hotels. Much lighter to carry than extra clothes. Clothespins in case you do laundry and don’t want it to fly away in the wind. Pen, paper – if you want to make notes and write down your deepest thoughts. Guidebook. Helpful if you get one specific to your route and which is light to carry. Accessory Straps to strap stuff to your backpack or anywhere else. Here’s some examples. Whistle. Good to have for signaling help and light to carry. Get one that you can attach somewhere and that you can easily find. I think it’s a given that you will have devices with you, at the very least a cell phone. In fact, you should not go without a cell phone. If you get into trouble, it will probably be your connection to the world to get help. Make sure you conserve your battery – there’s no guarantee you will be able to charge it in mountain huts. A watch is good to have since you want to be conscious about when it gets dark. 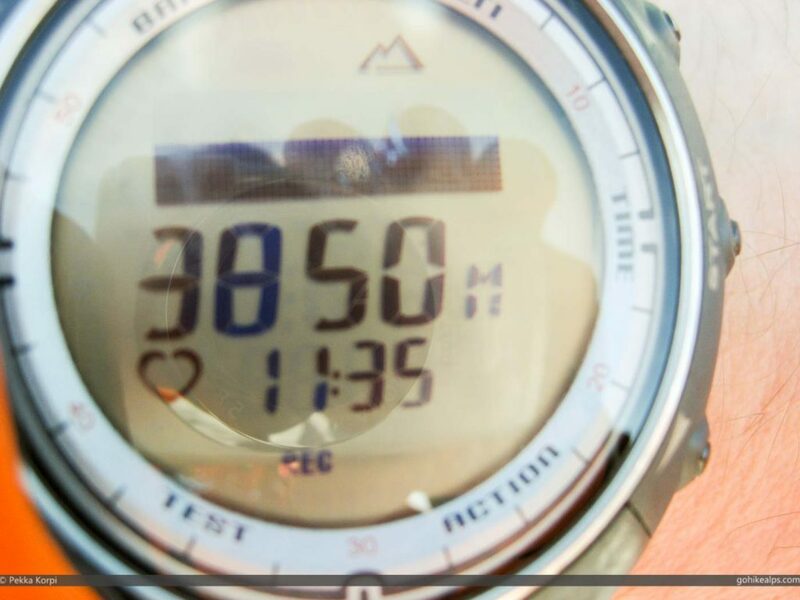 It’s also useful to have an altimeter in the watch, sometimes it helps you navigate if there’s poor visibility. There’s plenty of options with long battery life. You can, of course, get a cool GPS enabled multi-function watch for tracking your progress, calories and other fun stuff. I also love seeing where I was afterwards in Google Maps. Unfortunately, GPS tends to make these devices very power hungry. Several times I’ve only been able to track the first day due to not being able to recharge. I’ve sometimes thought about taking a really light laptop with me to the mountains but never have. Unless you really, absolutely have a compelling reason to carry it, I would leave it behind. Even if it’s an Ultrabook, it’s still more than a kilo of extra weight. Chances that you’ll break it or that it gets too much moisture are high. And the recharging problem exists for this, too. For my next hike I am thinking about maybe bringing a light weight tablet. I’ve got an old Sony Xperia Z2 which, among other good qualities, is water and dust proof and has decent battery life. (Here’s the Sony tablets on Amazon)As long as I get an internet connection and the occasional recharge, I should be able to manage my life with it. I might even be able to edit photos and text enough to post on this site in real time! I’ll end this section by saying that leaving email and social media behind, is worth trying. 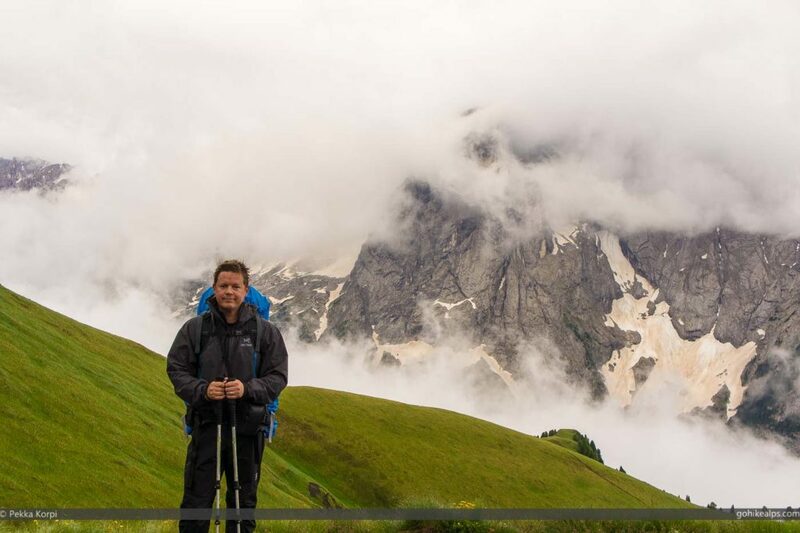 After all, going to hike in the Alps often is synonymous to getting away from it all. The battery issue. A separate camera won’t drain your cell phone. Image quality. Even though cell phones take great images these days, most likely a separate camera will produce better ones – if that matters to you. If photography is a hobby for you, then the Alps are a real sweet spot to be in. The question then is rather the amount of gear to carry. What can you do without? Obviously a full size DSLR camera with a selection of lenses and batteries doesn’t work too well if you need to carry it around in your backpack for days along with the rest of your gear. For me, a working compromise is APS-C sized cameras with interchangeable lenses. A lot of the photos on this site have been taken with an old Sony NEX-5 and I currently carry a Sony α6000 with two extra batteries (which are small in size and weight). Both are small and light enough to carry and the image quality, especially on the newer α6000, is excellent compared to the weight. Take an extra memory card, too. If you’re staying in mountain huts, you can’t wear your hiking boots inside and you want to leave them to dry anyway. Many huts have “hut slippers” but I, for one, am not at all comfortable using them considering how many sweaty feet have been in them. I carry slippers or very light shoes with me for this purpose. I see a lot of people using Crocs. You also want to some clothes for the hut. Whatever clothes you wear to get to the hut will probably be wet, sweaty and smelly so having something clean and comfortable to wear in the hut is preferable. Your fellow mountaineers will appreciate this. It’s in the list above, but I’ll stress it: if you stay at mountain huts, get a bag liner for sleeping in. The huts don’t provide sheets. This is dependent on where you go and how you plan so think twice before leaving these out. This list is based on the assumption that you will be in the Alps, spending nights under a roof and generally eating in mountain huts or restaurants. Bear spray. Although some exist in some areas, most likely you will not meet them. You’re lucky if you do! You’re right. My packing philosophy is not light weight but I am trying to get lighter year by year. For me it is true that sometimes at the end of the trip I find things in my backpack I didn’t use. If that happens trip after trip and they’re the same items, they’re probably unnecessary weight – with the exclusion of any safety related items you hopefully don’t have to use ever. Reducing weight at the simplest is pretty easy. Instead of carrying 6 cotton shirts for six days, carry two that are Merino wool. Carry some washing powder and wash your clothes on the go. You can do this in many mountain huts, too. Instead of carrying a monster 70+15 backpack like I seem to do again and again, get a smaller (= lighter) one. A lot of people in the Alps hike for days with a day pack! I’m sure they’re not packing my full list. There’s plenty of people who swear by light packing and are devoted to shaving off gram after gram of their backpack weight. I absolutely encourage this! It’s obvious that every extra kilogram you carry strains you. I try to reduce the weight I carry, of course, but find it difficult to do after the obvious steps. Buying more and lighter stuff is what I do when I need something, not because something lighter becomes available. But that’s just me! It doesn’t make sense to be cheap about your equipment. You should by quality products, even if they may seem more expensive. These are items you will be relying on for your comfort and safety. Most of the clothes and things are completely usable for other activities so an investment made into most hiking equipment isn’t only for hiking. When buying shirts, mid layers (and outer layers), make sure that there are no seams against your skin in the areas where your backpack weight is. About trekking poles: make sure that the poles you get fit into the bag you’re going to travel with. The ones I currently have only barely do. PAPER MAPS. If you read through the posts on this site, it will be pretty clear that I strongly recommend getting paper maps for your trips. The batteries on your phone should be saved for emergencies, not for GPS. At the end of the day we all need to decide what items are essential and what works best. It is a truly personal choice. This is not a gear review article in any way, and all the recommendations I’ve made towards specific products or brands are solely based on my own experiences. All the gear I’ve ever used and use now has been paid for by my own, hard earned money. If found this article useful and consider buying any of the items mentioned here, please also consider using the product links on this page and elsewhere on this site. The links on this page go to Amazon and if you buy something, Gohikealps.com will get a small commission. There is no cost to you but you will directly support this site! Is there something in this article you disagree with or do you have better recommendations? If so, please leave your comment below. Happy hiking – Feel free to share this! Pekka is an Alpine Enthusiast both in summer and winter, hiking and skiing as much as possible. 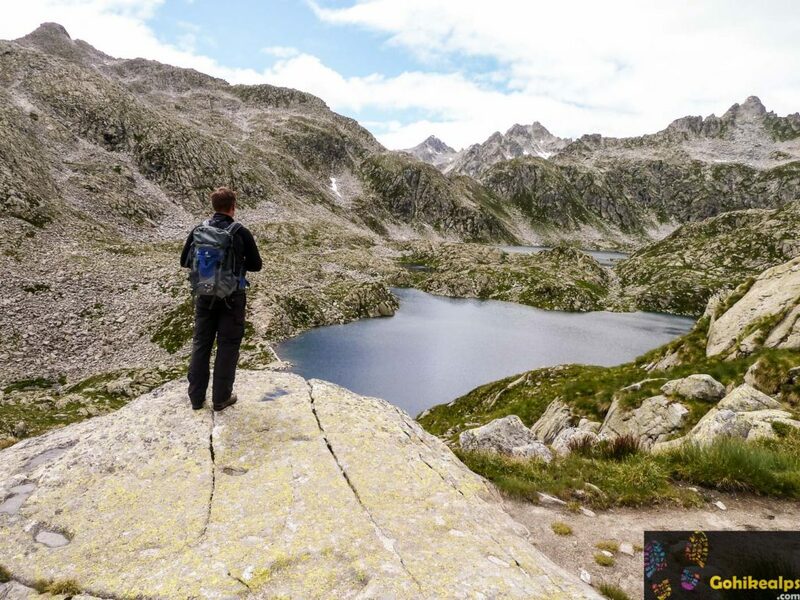 He established gohikealps.com to help hikers from around the world discover the Alps - through Inspiration and Advice. Very helpful list! Our favorite Merino wool clothing company is Ibex in VT. Used in trekking in Scotland, for the rainiest treks ever. We also love Deuter backpacks, which we use for multiday offtrail backpacking in the high Sierra of California. Thanks for the great advice about European trekking. 5 Best Airports to Reach the Alps. 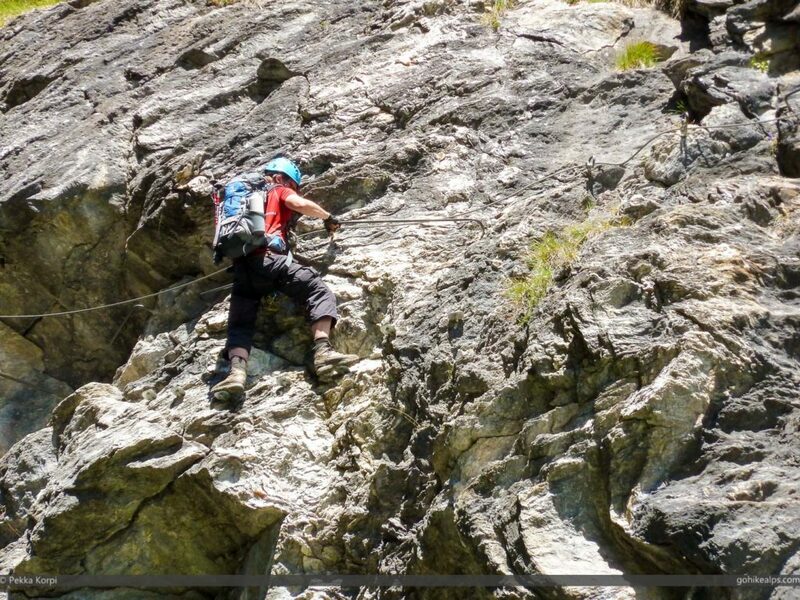 St. Anton am Arlberg – Basecamp for Vorarlberg Hiking! Thank You for subscribing! Now download the Checklist and enjoy your hike!